A little spitshine here, a dash of paint there. This is just a quick update. I mentioned, sheesh, a while ago, that I wanted to change a few things around the site. My URL is still the same. I just swapped out the title. You’ll also notice a sweet rough new graphic in my header image. I asked a friend of mine to help me out. This is where the long wait came in- he had work things and all kinds of other stuff come up in the mean time. He got it to me maybe two weeks ago, and I procrastinated on laying it over all the header images. I finally talked myself into it this morning, and any new header images will get it overlaid from the get go. All that’s going to happen from now is that he’s going to slowly clean up the rough edges you might notice. I’ll add that whenever it’s finished. 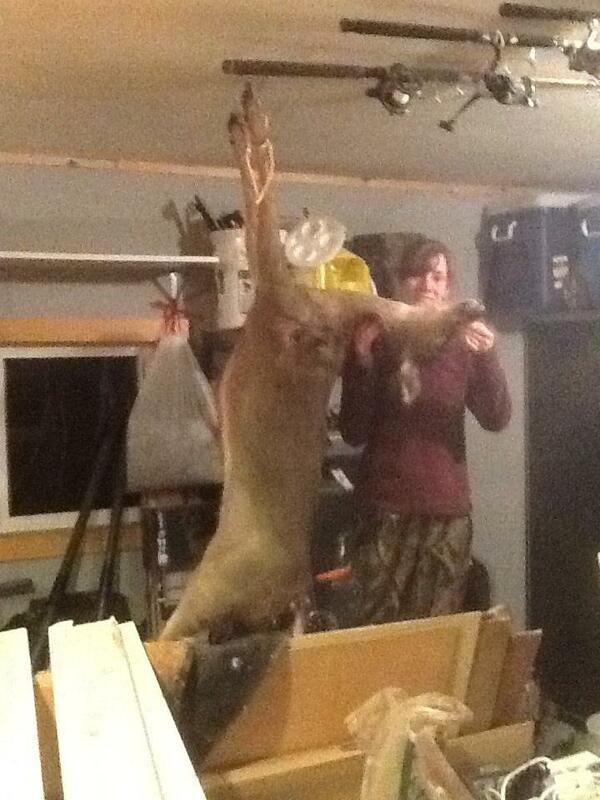 Holy Moly, Hunting Season is Nearly Upon Us. Good news: Matt replaced the power cable for my laptop. This cuts in half the amount of time it takes to crank out a post, and it reduces the number of curses I mutter as I backspace (again) to delete letters and punctuation marks the virtual keyboard thought I hit. Actual, physical keyboards are the way to go. It also means I have two camera options again. Bad news: I worked a twelve hour day on Saturday, and I closed Sunday evening. Matt had to run to the office Sunday morning, and get a haircut before I went to work. So, we didn’t do anything over the weekend, really. He sanded some more on the big boat while I was gone Saturday, and organized our garage (thank goodness, it was beyond a mess in there). However, Sunday morning, as I sat and had coffee and breakfast, it occurred to me: It’s already August. In Wisconsin, early goose season begins September first. Bow season for deer is September 14th. Fall Turkey begins September 14th as well. Duck season will begin somewhere in there (not yet announced), and I want to go out sturgeon fishing. I have less than a month before we enter our hunting season schedule of go-go-going until January. Last year, we were out hunting most weekday evenings, and literally every weekend (waterfowl in the morning, deer in the evening) from September until November when the boat trailer blew the tire. After that, we were still after deer as much as possible before we could go out ice fishing. 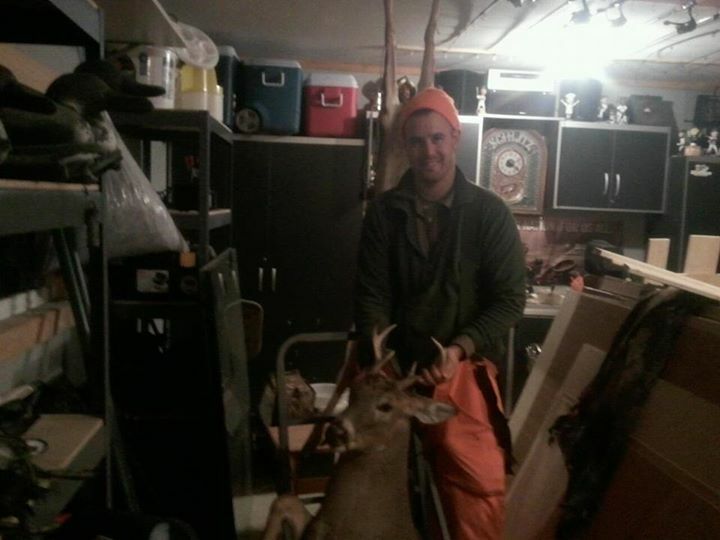 Matt’s second buck, and largest. A basket 6 pointer from last Fall. My first deer, a big doe. Opening day of gun season last year. 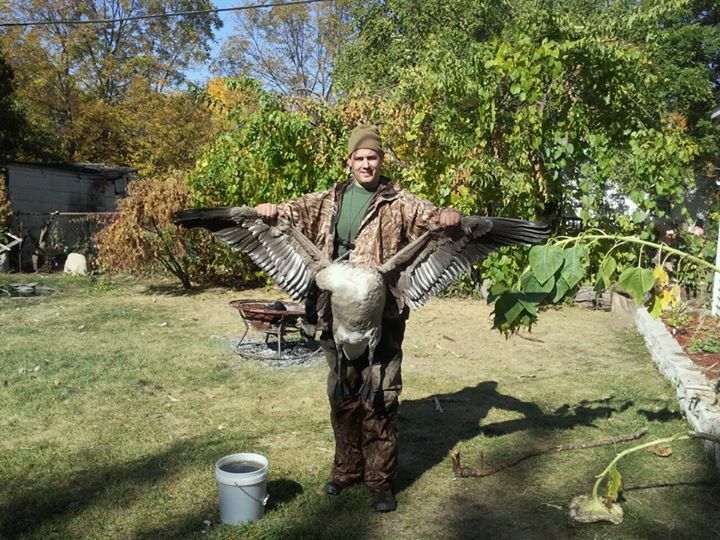 Matt’s first Canadian Giant goose last year. I haven’t been shooting yet this year. For bow or my shotgun. I still haven’t fired the rifle Matt wants me to use when we go hunting up north. We’ll remedy that over vacation (in two weeks!!! ), which is a relief. We’ll be going into our second waterfowl season. We worked out some kinks last year, and I imagine this year we’ll find even more. It’s also possible I’ll even get actual duck hunting camo. Last year, I went out in woodland camo. But women’s duck camo is even harder to find than women’s woodland. I’ll be heading into my second deer season. Maybe I’ll even get a tree stand instead of sitting behind a portable ground blind. We’ll be refitting and replacing some small equipment, as well as getting some bigger stuff. All I know for sure is that I’d better start stocking up on sleep, and portable snacks for the field. We’re Looking at a Busy Week Around Here. So, I’m making a quick note here that I’m queuing up some content to be posted over the next couple days. I’ll have another post up tomorrow morning about the rest of last weekend, and I might make a couple quick posts on the progress with lifting the engine. My turkey tags start on Wednesday, and my work schedule for the weekdays is centered around trying to hunt evenings on Wednesday and Friday, and morning hunts for Thursday, the weekend, and Monday and Tuesday of the next week. However, I work all day today, all afternoon and evening tomorrow, from 7am-2 on Wednesday and Friday. Plus, I need to get my garden in, and someone has to do laundry, dishes, yardwork, grocery shopping and housecleaning here. And cook dinners. I also hope to tape off the windows and so forth on the camper so Matt can paint it, since we’re going to have nice weather for most of this week. That will be one long project finished and out of the way, at least. Plus, this month is usually a busy one for Matt. But by the end of the week I’ll have a preliminary post on the first bit of turkey hunting. We contacted the guy who offered to let Matt hunt his land, and we’ll set up some times with him. We’ll also be hunting out at Sunny Slope, or Goose Lake. I may even be going out on my own on a couple of the days, as Matt has work functions. A Slow Weekend Around These Parts. There isn’t too much to report from this weekend. With the winter storm (are they really still winter storms at this point?) all last week, rain forecast for the entire weekend, a work function for Matt Saturday and a meeting for me on Sunday, we didn’t have any hard and fast plans. Imagine our surprise when it rained neither day. 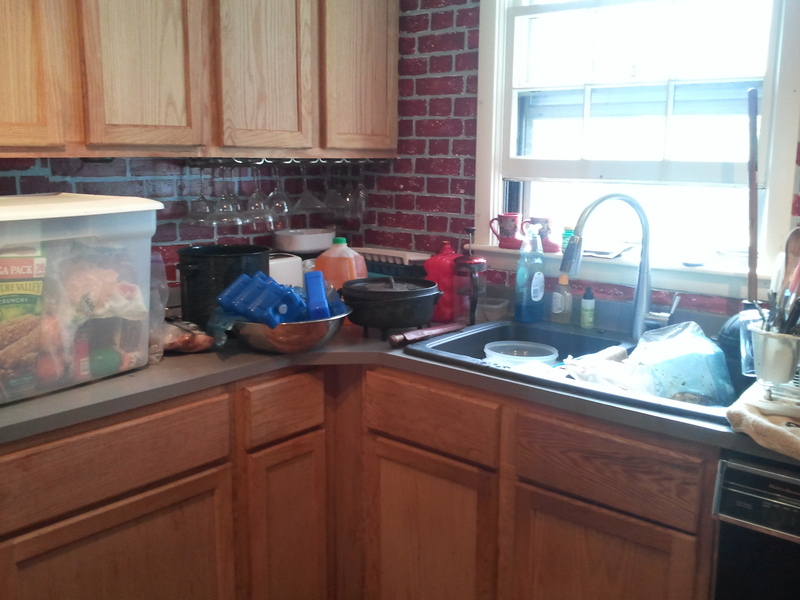 We got some stuff done around the house, though. Do not mind your blogger’s ghostly claws. 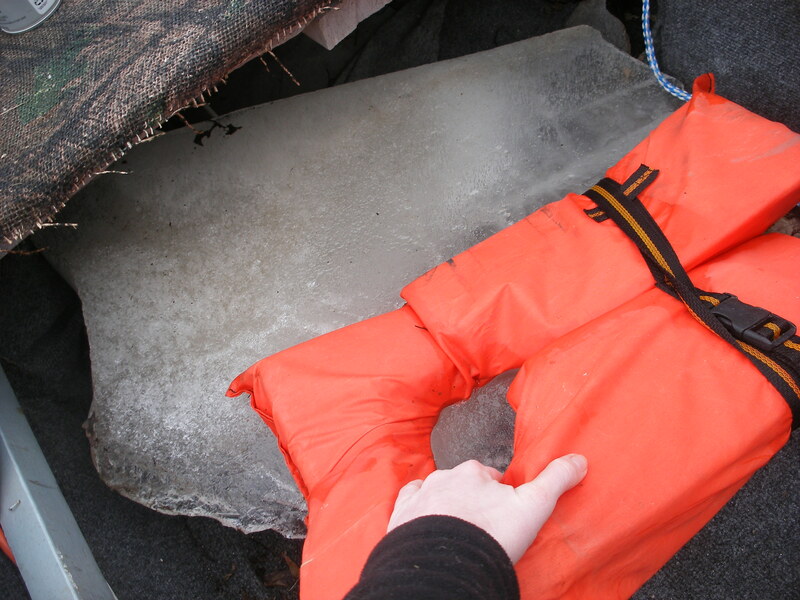 Remember the huge ice chunk in the front of the boat? 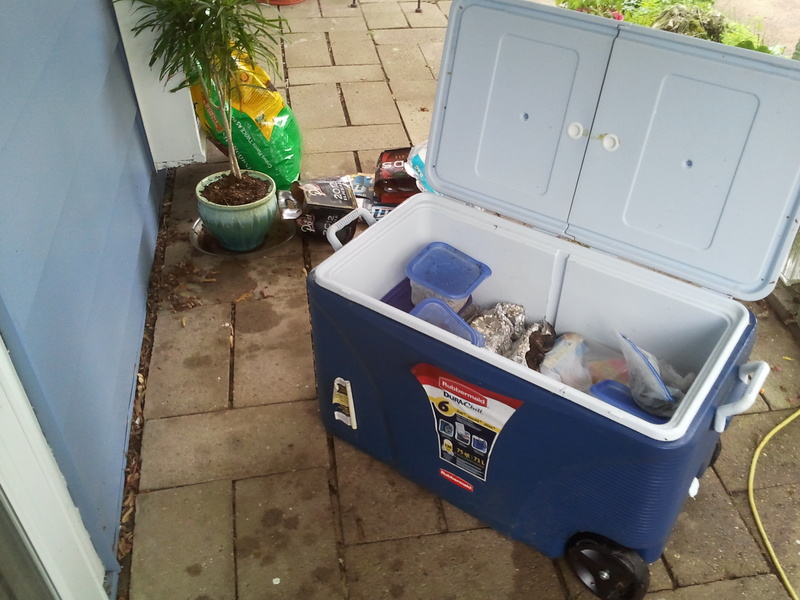 Saturday, while Matt was at his work function, I stepped outside to bail more water so it wouldn’t rot out the wooden bottom. I noticed the ice hunk had shrunken. So I poked it with a shovel. It moved, so I grabbed onto that there life vest and gave it a tug. It slid most of the way out. It was frozen around an extension cord running to the front bowfishing lights, but I figured at least this way the sun would hit it. Matt later broke it apart in his typical Hulk-Smash fashion, and now the ice is all out of the boat. He also loosened all of the lug nuts on the trailer tires, and he’ll be picking up tires at some point today or tomorrow. So, by next weekend, we should finally have a functioning boat trailer again. 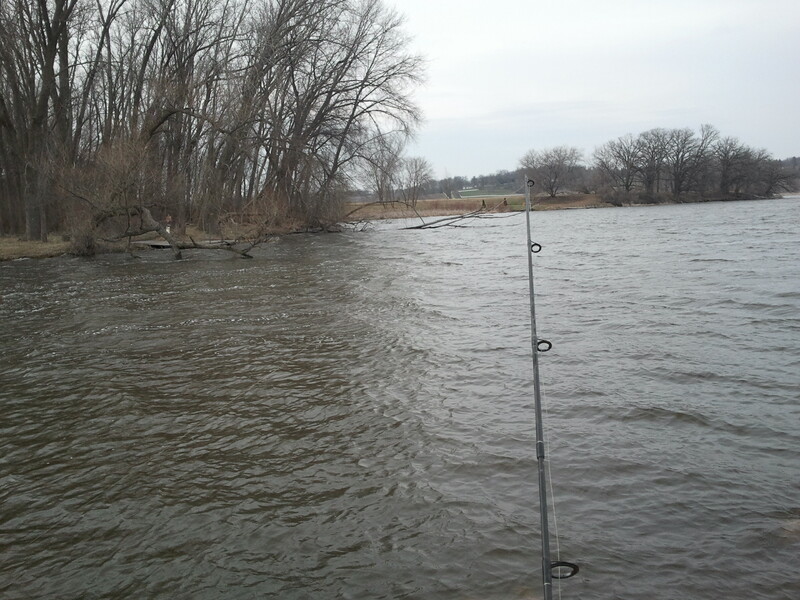 The lakes finally opened up this past week, so it will be good to get out and motor around, or bowfish. Remember the dryer I mentioned? Whenever we first picked it up, it was missing its cord. 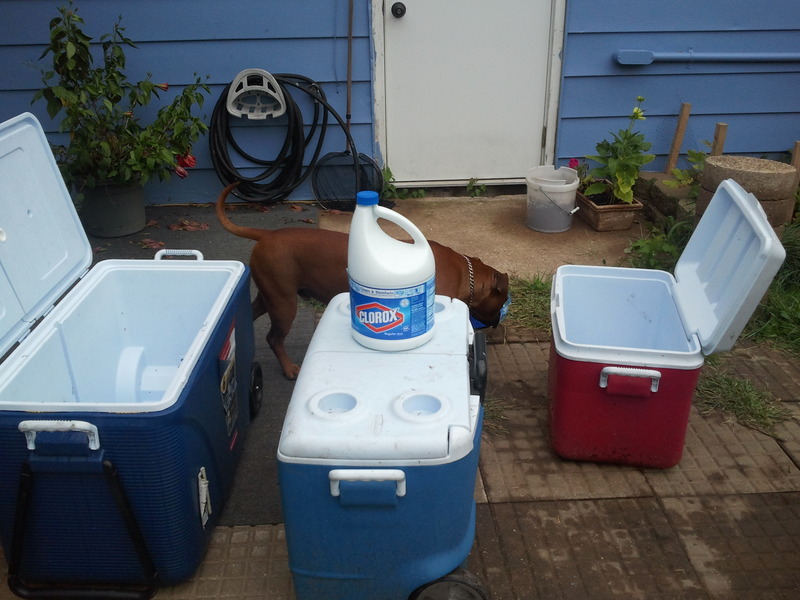 We picked up a cord and a box to plug it into, but our garage was not wired for the electrical load of a dryer. So, fast forward to this weekend: we have heavier gauge romex, and we’re re-wiring our garage. Years ago, before I showed up, Matt had finished the garage to be his mancave (we can’t get our cars back to it anyway). 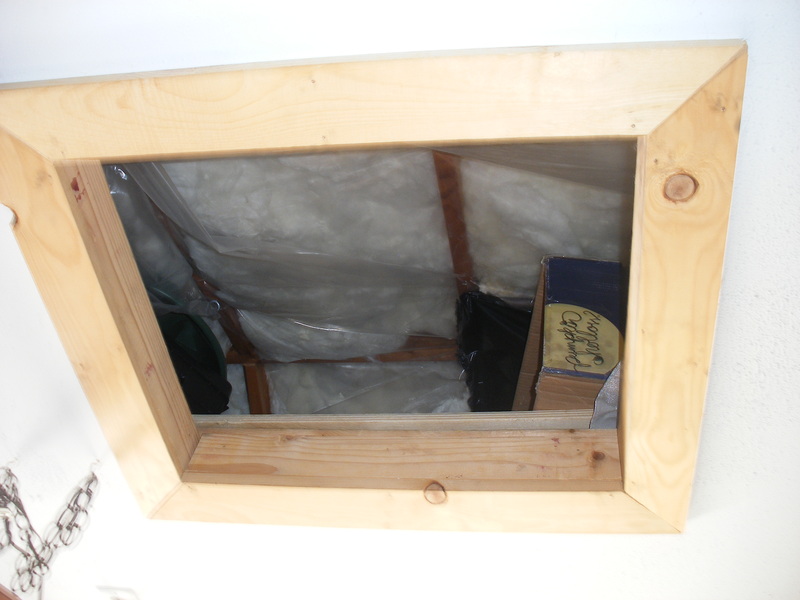 The small crawl space up in the rafters above the ceiling is storage. However, yours truly is the one who always gets stuck going up there, whether to haul down holiday decorations, or in this case, to crawl through mouse poop, the desiccated remains of a squirrel, dead wasp bodies, and falling-down fiberglass insulation. I had to go in there. I pulled the wire up through the ceiling drywall, spliced it together with another length of romex (the first roll we bought was short by 10 feet), and crawled down to the peak of the roof to poke it through a hole in the outer wall to be run to the circuit box. We plugged in the heavy duty breaker, wired it in, and then flipped the switch. No fire, no explosions, no fatal electrocutions, plus the dryer ran. The heating element on it was broken, so it just tumbled the hides around in there with an old pair of Matt’s tennis shoes to beat them up. They’re still going. We did make a quick attempt to fish, since most of the waterways here have dropped a bit after being near flood stage all last week. It was bank fishing from a spot where we always see lots of trucks parked. We didn’t catch anything. The current was up, the water still quite murky, and it was very windy. It didn’t help that the spot was incredibly littered. Fishing litter, yes, but also just garbage from the road. It was sad. This also happened to be the the lower end of a marsh that we fish for catfish and use for duck hunting. 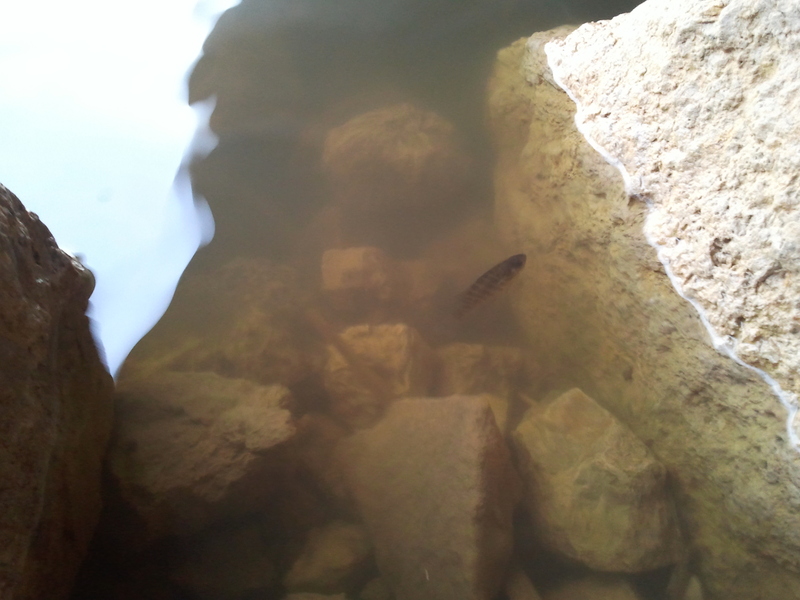 Like I said, no fish to be caught, but I did see this little guy. I considered adding this onto the end of my last post, but figured a separate post was better for everything that I ended up thinking of. I plan to add a calendar widget with opening dates for some of the seasons around here. I want to have a little structure laid out for myself. We won’t have as many outdoor activities here in March, but I can write about a lot of what happened for us last year. We’re also hoping to make a weekend trip to a river near Racine, where lake trout and salmon spawn. Matt wants to charter a boat to go out on Lake Michigan for salmon fishing. If we can get the required 5 or 6 people together, it comes out to about $100 per person. Bowfishing. Seriously. Common Carp spawn in the spring, and there’s quite a few in the Madison chain. The Illinois Valley, where I grew up, is plagued by Asian/silver carp. Those things are fun to shoot, they spawn in spring as well, and I’m more than glad to rid my home area of them. There are also gar and bowfin not only in Madison’s Lakes, but in nearby Oconomowoc. Catfishing up on Cherokee Marsh. Matt wants to catch a 30 pounder this year. Aside from fishing, turkey season is coming up. We purchased second season spring permits, but our zone normally has thousands of leftover permits for the first season, which go up for sale at a great discount. This also means we need to find me a shotgun that is my size and can be choked down. Keep an eye out for posts as we learn to call turkeys. I have some video footage of our first attempts at diaphragm calling. Repairing our boat trailer. What happened to it is an entirely separate, entertaining post, and I have about a month of posts to cover. Finally getting our camper finished. I decided to refinish all the fabric surfaces in an old camper Matt found after a bad experience tent camping near home in Illinois while bowfishing for silver carp. Finally processing all that deer meat and the hides. More dispatches from Matt’s toybox. Gander Mountain had a sale this past weekend on fishing equipment. He also bought some stuff related to turkey hunting. Maybe also a dispatch from my toybox. I’m in the market for a shotgun my size for turkey hunting, and also waterfowl when it comes around. Wild Food. Once we process that deer, we’ll have more than enough venison to cook. There’s catfish from last year in the freezer, and I may finally get adventurous enough to try to cook the fillets of silver Carp (it’s not supposed to taste too bad) as well as the coots we shot last year. Possibly shooting practice? I’m a fair shot at stationary targets, but I need practice for waterfowl and turkey.